Watch any cat for a few minutes, and if he or she's awake, you'll see them grooming themselves with the help of their rough pink tongue. While this is a natural part of cat behavior, it is also the main cause of hairballs. A hairball is just what it sounds like: a ball of hair. The technical term is trichobezoar. If you get hair in your mouth, you can just spit it out. But you cat can't do that. Instead, she has to swallow the hair that comes off on her tongue during grooming. The bad news is hair can't be digested. Normally that's not a problem either. The hair can still pass through the digestive tract and come out as part of the waste. However, sometimes the hair builds up in the stomach and can't pass through the cat's intestines. When that happens, the only way your cat can get rid of the nasty ball of hair is by throwing up! Although seeing a cat vomit can be a disgusting and nauseating process to witness (the sounds alone make some pet owners gag), it's better than the alternative. 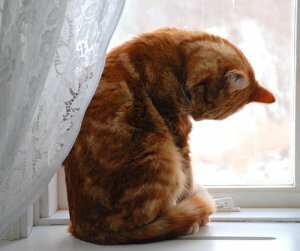 When your cat can't throw up the hairball, they could end up with an obstruction that could be life-threatening and require surgery. Most feline owners would rather clean up a disgusting hairball then watch their beloved pets go under the knife. But, thankfully, we have more options. We can actually prevent the formation of hairballs and reduce the risk of complications. Here are three tips that can help you help your cat. When your cat is shedding a lot or needs a good brushing, he or she is more likely to develop hairballs that will need to be coughed up. You can help by spending time each day brushing your cat. Some cats love being brushed and will actually beg you to do it. Others aren't crazy about being restrained and brushed so they are more resistant. But you can teach your cat to like getting groomed. Over time, even the most reluctant cat usually learns to love being brushed. Besides helping get rid of too much hair, regularly brushing reduces the amount of shedding your cat does (that's good news for your furniture and clothes) and provides you with a great opportunity for bonding. If you look at the treat section of your pet store, you'll probably find some specially formulated treats designed to help break down hairballs in your cat's stomach. Most of these treats come in delicious flavors – at least as far as your cat is concerned – so they eat them well. This might be a good idea if you notice your cat coughing up a lot of hairballs, or even just coughing without throwing anything up. Sometimes a stubborn hairball can use a little help. Most pet stores also carry petroleum-based products that can be used to lubricate the cat's hairball and intestines to make its passage easier. These products are 100% safe and come in cat-friendly flavors. Sometimes they can be added to the cat's food. A combination of all these methods can help control your cat's hairball problem and can prevent life-threatening complications. And for you, the advantage is that you'll spend more time grooming your cat, and less time cleaning up.